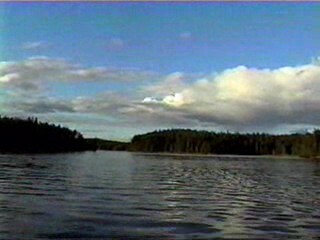 In Woodland Caribou Park, Dunstan Lake, located in the center north quadrant of the Park, stands out in my canoe repertoire as it is very difficult to get to and it is a remarkably beautiful little lake. Few people self-propel there. For a canoe guy this is one of those really nice places to visit. But you have to get ready for it because it’s a bit of a tough go to get to the access points. Tough but totally achievable. 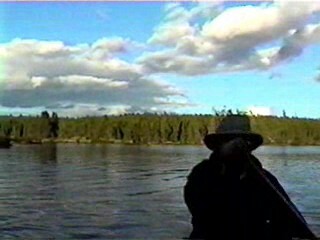 In this story we found ourselves greeting the morning somewhere on the Bloodvein River a bit damp but excited about moving through to the south end of Simeon Lake to attempt our first north entry passage through Simeon Creek into the jewel-like Dunstan Lake. It was after all, our first time directly south through this part of the country. Excitement was where it was at. I really delight in traveling through new canoe-only passages. It’s why I go where I go. The heady drunkenness of the experience is balanced by an acute awareness of the remoteness and frailty of one’s situation. For me it’s absolutely visceral, elemental and immediate out there. Once off the cold Bloodvein waters and into South Simeon Lake the pace slows around us. I even breathe better. Soon we are two portages from the motor boats so we’ll stop. In a bay with a south west view and several terraces above the water edge we found a camp spot. 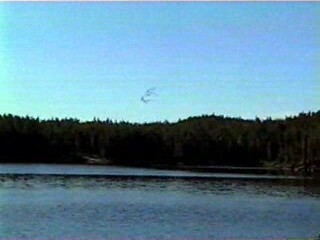 In the evening we sat watching two huge winged creatures in a pas de deux far above us. This graceful dance in gyre-like updrafts was joined by two more heron and effortlessly a stunning performance began. Backdropped by a golden sunset puffy white cloud extravagance I quietly hummed a slow waltz and the four gliders didn’t miss a swoop. They seemed bent on dancing the night away and soon disappeared over the horizon and away from our view. Slowly the reds took over the colour scheme and a tres red sunset followed as the closing act. I retired to the tent to dream about this. With an eagerness fueled by a great breakfast and unbridled optimism we approach the thinning of the water-way and a ways ahead on the map little red lines and arrows were shouting "shallow" and "rock garden" and I happened to notice at that moment we were drawing about eight inches of water and the paddle often scraped the gravel of the river bottom. It was a blue sky morning. For now. It’s about 3 miles from South Simeon Lake to Dunstan Lake. The leisurely pace of the meandering creek allowed us to look around a bit. The canyon-like passage fascinated me. Often,sharp, steep granite walls with small trees and bush to the edges. Barely enough to get your finger nails on much less a camp site. I expect the resident animals to appear on the crests of the walls licking their lips in anticipation. Then, somewhere in the creek, at another bend, Bob pulled back on the paddle and said, "Look at that Baal ". Well you’ll never believe what we saw next! Straight ahead an oblique shard of granite some 20 feet high jutted out of a small marsh pocket a few feet in front of the cliff and on top, the very top, of the shard, was balanced a huge round rock - probably 6 feet across. We sat in mute appreciation. 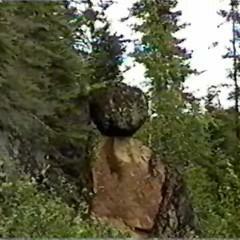 This rock formation must have perched on top of this splinter for the last 10,000 years. Since the last great glaciers, several miles thick at this part of the planet, retreated and left behind tiny gravel deposits (tiny to glaciers) and this bit was unique in that it wasn’t lying on the ground or in the river. The sheer size of this installation piece was worth the look. I have never read about it in journals of traveling this area so I have to assume that few, if any, canoeists have noticed this piece of geological art . The temperature was over 30 Celsius, (plus 90 Fahrenheit), the sun was high and the creek turned into a barrage of rock garden. This gateway to the most beautiful lake in this park quadrant was guarded by an arduous, sweat inducing passage, a real dray-horse haul, but to my great delight there was a noticeable absence of biting insects of any kind. We were again blessed with nature’s indifference. Sometimes the indifference brings monster gales with cold weather and high wind. Sometimes hot weather and no bugs. It’s just what it is. Today we would be porters and carry everything we owned many times over. The four or five liters of water that I consumed were returned to the river through my sweat. It was a good day. Surprisingly, the wind was steady that hot day. We were in a small canyon running north to south and the wind was a westerly. The small cross breeze it created was just enough to lift the waves of heat that were roiling off my body. I started thinking about water again. I looked at the water in the creek and the dark brown porridge-like muck held little promise as a refreshing drink. We human beings walk a precarious and fluctuating line in our relationship with water. Our bodies are, after all, about 60 % water. And we can’t afford to lose too much of it in a given day. There are people called dipsologists who study sweat/pee/respiration and the subsequent dehydration in human beings. They say that if we lose about 2% or 3% of our body weight in water we’re moving into troubled waters and if it’s a greater loss, say 4 to 6% then look out because this becomes life threatening. So what does that mean? I wanted to know what the numbers meant. The numbers suggest that sleeping and gently working around the campsite on a sit day will sweat/ pee /breathe out about 1.5 to 2 liters of water throughout that lazy day: that’s about 5 - 6 glasses of water. This very day, however, I was probably breathing out/sweating about 1 liter or so every hour of travel because of clear blue sky and white hot sun and carrying many heavy loads through Simeon Creek (more like Simeon Trail this day). A guy about six feet tall and 180 pounds has about 50 liters of water in his body. This makes 2% of body weight translate into about 2 liters of water. Do the math for yourself. Dry mouth begins at about ½ liter down. But we aren’t driven to drink water by our body - yet! At several liters down the body begins to do stuff like telling the kidneys to start conserving water and then urine output becomes much less and much darker as the water is extracted and retained in your body. I’ve been told that a 3 to 4 liter deficit was bad news happening. And the deficit can begin to accumulate days before. Down 5 to 7 liters, and this can happen in just one day) will place your body in a state of serious mental and physical deterioration. Bad decisions and weak bodies. Curiously, our bodies don’t acknowledge the water deficit while we are creating it but tells us to begin drinking several hours after the fact. Out here we need to thwart this non action and drink regularly. This is in part due to one of the other little quirks of the balance of water in our bodies and one marathon runners know well, that is, we can’t absorb water through our stomach as fast as we can drink it so we need to sort of keep up with the water loss throughout the day while it is happening. The last ¼ mile before Dunstan Lake we just walked in the river. The bottom was firm gravel, ankle deep water and easy to walk on. The portage into Dunstan was quick, just a carry over, and we set off looking for a home. Finally we’re here and what a pretty little lake. The sunset blanketed us with a palette of brilliant colors and we accepted the first fire-pit we saw as evidence of a probable campsite high on an isthmus half way down the west side of the lake. The fire-pit was overgrown and the site undisturbed. There was a bit of an irony that this is the first fire-pit we have seen this trip. I’m physically tired as I begin the set-up-camp routine and we move into the evening. But boy o boy am I excited to be here. The moving picture show continues unabated. The visual images fill my head and I store them away to savor in my dreams and revisit them next winter. Dinner is followed by a small fire and a celebratory wee dram. Another priceless day and evening. The next morning as I stumbled around a genteel honking of ducks came from up lake so I raced out to the tree at the edge of the rock ledge and they appeared over the north ridge dropping out of the sky and skimmed the water of Dunstan Lake from north to south, perhaps 40 or 50 of them in a tight V formation flapping by while they quacked an incomprehensible message. This was the Doppler effect in action. The closer they came, the louder the quacks and then they passed and their conversation diminished to a faint noise. I was at the same elevation on our rock ledge as the flock as it blustered by. They were so close I could see their eyes and feel the air flap from their wings. I ran and grabbed the camera. I watched their butts wiggle away and then they were gone over the south ledge and the quiet returned. It would take us a day to get to Royd Lake portage which would present a stiff unknown 900 pace carry over at the end of it. Triple portaging was our fate so that would be a bit of a walk. We’ll talk about what and why we pack that requires a triple carry later in the story. 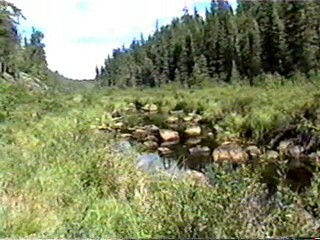 At the south end of Dunstan Lake is a confluence of streams. This was a remote canoe-only junction I had wanted to see for some time. Very few pass this way. One stream comes from Terry and Wanda Lakes in the west the second from South Dunstan and the third we were traveling on from the north. In this land mass area is a height of land. Check the maps. As the water level dropped and we worked like dray horses pulling the canoe through the black porridge-water we came upon the junction of the three streams. The previous day while looking at the maps, in my minds eye, the vista had been more bucolic and had considerably more water. We were in a low marshy area and the muck was persistent and seemingly a depth without end. Feet were sinking and sticking and sweat was pouring. Looking at the map I realized that we probably had a mile of canyon to go through to get to substantial water. Yikes. Well we got out and pulled the gear and canoe and mentally prepared for the episode. It took us about ¾ hour or more to just get out of the boggy junction and move slightly east. We weakened mentally. The distance wasn’t that great; it’s just that it seemed at that moment to be unendurable even though it really wasn’t. We found the stream bed heading south east and in a swirl of belching muck proceeded. 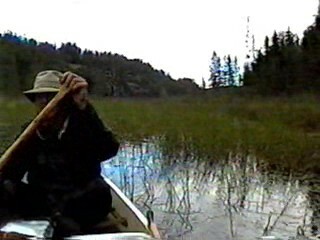 Sometimes one foot in the canoe and one in the bog but mostly both feet a few feet deep in antediluvian muck. Hmm, I thought as I hung on to the canoe and reflected on the map. Well you’ll not believe what we saw next! Those little beavers. They sure can be helpful in remote passages. Just like that, merely twenty feet ahead of us was a towering beaver dam - about five or six feet high and the width of the canyon. Instantly I realized that it meant deeper water on the other side. It’s sometimes difficult to explain emotions and more so when they are elevated by simple things. But let me tell you my spirits soared at the sight of that dam and what the implications were for us. Hoist everything over the dam and back in the canoe, the rest of the day was a splendid paddle day. Good beavers. The meandering stream behind the dam was a welcome break from the day’s activities. We practiced our steering in the tight twists and turns of the winding stream and relaxed. 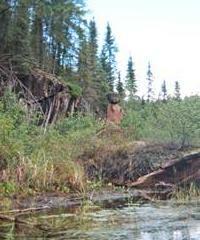 The beaver highway took us to the next portage. And lunch. 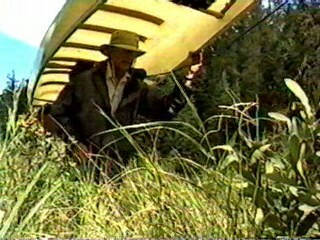 After a small portage to the water that will take us towards Royd Lake we paddled a channel that was lined on one side, a straight line maybe a ¼ mile, with white water lilies. Big white pods. It was beautiful. Did I mention the following wind we had for the five mile run south to the portage? It was another stellar day on the water. The pushing and pulling and dray-like activities were taking their toll and fatigue set in so we decided not to do the last portage into Royd Lake. After all it would be over 4500 paces by the time we finished. We’d save that for after breakfast the next day. 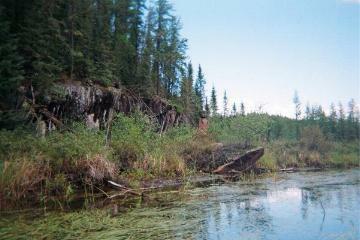 There are few if any campsites in the long narrow channels we traveled. Inventing campsites is a skill requiring sharp eyes and compromise. One rarely sees a fire pit in the channels. We leave it that way too. So finding a spot to make our home was the next task. This was difficult. Vertical walls and trees to the waters edge with Br’er Rabbits’ impenetratable thicket behind. We looked for an hour. Nothing! The light was dropping and we needed to get down for the evening. Finally on the east end of the lake I saw a ledge about 15 to 20 feet above the water that looked somewhat flat. I had seen it earlier but had passed on it because of the difficult ascent and the hope of a better spot. I for one need a decent sleep each night and a flat spot really helps. Sure we have the best Therma Rest sleeping pads money can purchase but flat ground is still King. 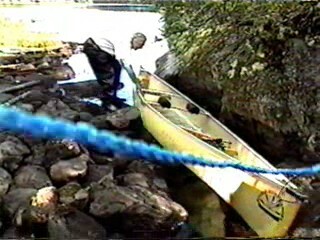 Fatigued, we pulled in and standing in the canoe handed the gear up the cliff onto the ledge. This was made a little more difficult by a fallen tree that we had to scoot under while passing the gear up. The site was a rectangle about 10 by 15 feet and more or less flat-ish so we fell into our homesteading routine. Supper was prepared and the site readied. Ah, home again. I always attempt to have a fire at the end of the day. It’s a reward for me. It’s like dessert. It works. But that night it appeared that this would not happen. No cut wood ready, none readily available. Sitting with my back on a rock the light had fallen and I was enjoying the still of the evening. The stars were coming out and I was tucked in, well actually the ledge was so small there was no room to walk around. Between us was a flat, bare rock a bit bigger that a dinner tray. I was struck with an idea. All day long I collect white birch bark and stick it in my pockets. It’s incendiary. It’s the best fire starter going. Well then, I thought…. I tore the birch into finger-like strips and whipped out my lighter and ignited the bark. It roared in its own tiny little way and sustained a glow of light over the small site and it cheered us up instantly. It was a fragile light that provided us with little more than an image - not really something of substance. Yet the light created a small yellow domed room in the middle of the darkness and that felt curiously comfortable. I played with the fire, on and off, that evening and felt it warm me up. Small fires are good for the soul. However the thought of three miles of portaging the next morning and a light, swirling rain beginning to obscure the stars soon sent me off to bed. Tomorrow the big lakes.